I am a little in love with Michael Pollan. (Don’t tell Mark Bittman.) But I suspected correctly that his recent little book wasn’t going to be anything earthshatteringly new. It was basically just a handy summary of some of his wise principles to keep in mind when making choices about food. A lot of it is common sense, though I think we all know that common sense isn’t as common as it should be. 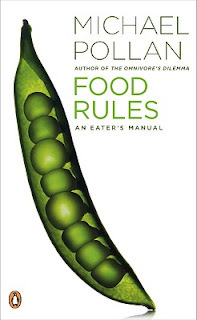 This small book - light on text and a very quick read - is basically a list of 64 rules about eating, divided into three section based on Pollan’s mantra “Eat food. Not too much. Mostly plants.” More accurately, it’s 3 rules with 64 ways to help you remember them. Pollan recommends picking one rule from each section to remember and use. Finally, “How Should I Eat (Not too much)” focuses on not overeating. I’ve been on board with Michael Pollan for quite a while, so his ideas aren’t new to me. (Many of the tips from the third section I read about in the book "Mindless Eating: Why We Eat More Than We Think" by Brian Wansink (also highly recommended) and they are definitely worth being reminded of.) Many of the tips are things I’ve been trying to keep in mind for a while now, though some are new, and some are definitely more challenging than others. For example, in the past year or so I have given up eating the tasty fake meats from Morningstar Farms because they are highly processed, contain shockingly long lists of ingredients and I’m not convinced they’re more healthy than eating meat. But avoiding fake meat products means more labor-intensive meals. On the other hand, the majority of my between-meal snacks are fruit and nuts, and that’s easy. I’ve been doing that for a while and it wasn’t even a conscious decision. Although I borrowed this book from the library, it’s probably a convenient little book to own if you want to be able to refer to it for new tips now and then. But I’m really looking for something new from Pollan, rather than a rehashing of ideas that we have already heard. I hope he has something exciting in the works. One more thing about the book: I can’t get the phrase “silence of the yams” out of my head now.